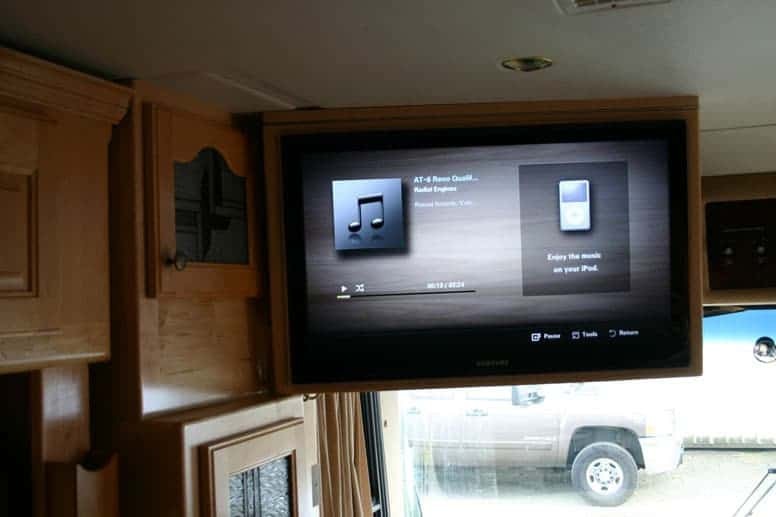 In the following guide, we aim to answer that question by offering an in-depth review of the best RV generators currently on the market and a detailed analysis of what goes into the making of the ideal RV generator for every type of RV. 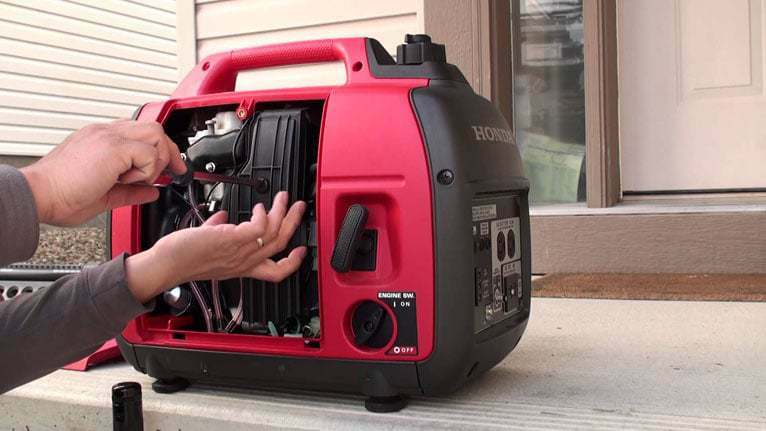 Let’s start off with our top picks of the best portable generators per category for 2019. What Is An Onboard Generator? Are Solar Generators Like Solar Panels? 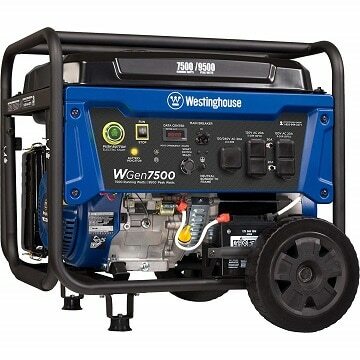 Do I Need A Portable Generator If I Already Have An Onboard One? How Do Portable Generators Work? How Loud Are Portable Generators? 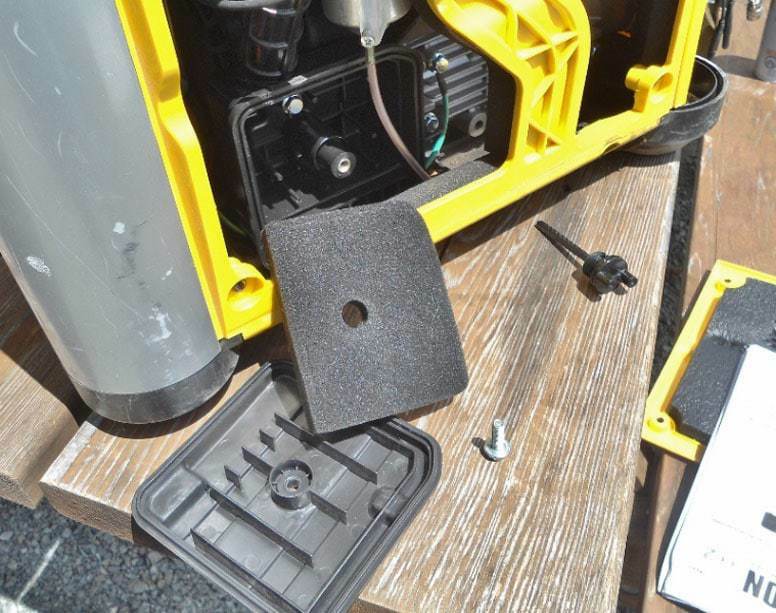 This Champion portable generator stole our hearts with this stellar solution. Every which way you look, there’s something to benefit from. As loud as a vacuum cleaner and compact enough for mobile storage, this 140lb portable unit gives you 12 hours of runtime and supports up to 15,000 BTUs of power for air conditioners. For a little perspective, that’s powerful enough to heat or cool up to 875 square feet. This requires 3.8 gallons of gasoline for a full run and comes with a 0.6-gallon oil tank. One of our favorite parts of this unit is the ample electrical outlet supply that also comes with Volt Guard’s built-in surge protection to provide a safe shield. You get a 120V 30A RV outlet, as well as a 120V 30A locking outlet, and two 120V 20A outlets for basic household items/small appliances. Smaller though important features, such as the three-way electric ignition, are fantastic additions that minimize your time to get set up, including cold start technology for every weather condition. Comes with a Champion-made engine, so you won’t have to have separate warranty information for the engine versus the electrical system/battery. With large purchases like these, warranty information is always a must – the last thing you want is for your investment to be squandered. Champion gives you three years on the warranty, and just for being a customer, you get free technical support for the rest of your life. EPA-certified, CARB compliant, and ready to fuel your off-the-grid lifestyle. Our runner-up comes with different features, and an equal amount of ease of use to our top pick. The Honda portable generator produces 2000 watts, and is extremely portable, coming in at just over 46lbs, and runs quieter than any other generator we’ve used. You get excellent fuel efficiency, with over 8 hours of use on a single gallon of gasoline (max capacity). This unit also comes with a low oil indicator so you can avoid issues. They call it Eco-Throttle, but this unit does come with an eco-friendly mode. When you hit 25% load capacity, it runs quieter and more fuel efficient. 2000 starting watts and 1600 running watts give you enough power to support a 12,500 BTU air conditioner (730 square feet of living space) and includes a stellar warranty. As a disclaimer, the warranty information still needs to be requested from the seller, but when you receive it, you get paperwork to go along with it: three years on parts and excellent customer support for technical needs. This comes with both compliance certifications and is ideal for the one-man army out on the road. Load this up, run it for the time you need it, and you’re good to go. The fuel efficiency is something we can’t get over – buying a five-gallon gas can at any gas station is enough to support you for forty hours of use with intermittent cooldown periods. You’re never RVing alone with your EU2000I behind you. Small, lightweight and ready to go when you are, WEN’s super quiet 2000 watt generator has some impressive features. With 12 hours of runtime, eco-mode enabled, and the ability to support up to 10,000 BTUs of AC/heating power, there’s a lot of value in this small package. This starts at 2000 watts and runs at 1600 watts, evenly distributing power to the 120V three-prong outlets (2), as well as the 5V USB port. You get a low-oil indicator that shuts down to prevent damage to the system, as well as overload protection for the same reason. The carrying handle makes this convenient to move around, and this model comes with a few perks. For one, if 2,000 watts isn’t enough for you, but you truly enjoy this unit, you can purchase two and an adapter to connect them and utilize their joint power. Apart from the quiet operation, this generator is prime for running multiple small electronics, and small appliances. With a two-year warranty and access to stellar customer support and technical support, you get so much more than just a generator; you get a commitment from WEN that you’re going to love your product. This model is not CARB-backed, but for its excellent features, it still found its way onto our list. This portable model comes in at just under 100lbs, so a two-man lift or keeping it stationary on the bed of a truck is recommended. With a four gallon tank, you get eight hours of runtime on 50% capacity, 3300 watts of running power, and 4000 watts of starting power. This is encased in a durable steel frame to protect the vital components from physical damages and comes with a one-year limited warranty for protection on parts on the off-chance that you sustain critical damages to your generator. This operates a little louder than a vacuum cleaner, giving you one 120V 30A outlet for high-powered tools and an RV hookup, as well as two three-prong outlets on a 120V 20A system. The price is one of the major attractions of this model. It’s inexpensive, has earned Amazon’s Choice ranking, and gets the job done when you need it to. This is ideal for up to three people using small, lightweight electronics with a few larger ones plugged in. If you’re going solo-RVing, this will be more power than you need for multiple items. These are the big guns for the family RV trip. Westinghouse doesn’t mess around when it comes to power and durability, giving you over 11 hours of runtime at 25% load capacity. When it comes to noise, decibel ratings are a funny thing. They don’t account for the type of noise. Most generators have a lot of exhaust noise, while this one has mostly mechanical noises, making them much more bearable and easy to listen to. You get a 120/240AC Twist Lock Power Outlet, which is compatible with the Westinghouse Transfer Switch, and comes with four 120V AC outlets for maximum output. This is one generator that won’t quit on you, no matter what. This generator is just plug-and-play and comes with an oil funnel, starter oil, and a customized toolkit specifically designed for maintenance and repairs on your unit. Your battery for the electric ignition is included; a very simple push-button operation gets you going in no time. This engine is high-performance and heavy duty and is best meant for larger families or big trips. You can support up to 25,500 BTUs of air conditioning power on this, which is the equivalent to an entire 1,500 square foot home. Built for power, built to last, and built superior. Last on our list is the powerful and portable Briggs & Stratton model. Quieter than normal camping generators and more than enough power to light up your RV’s air conditioner (up to roughly 8,800 BTUs), this stellar model features easy maneuvering with an H-style handle, evenly distributing the weight as you move it. You get excellent runtime and good fuel efficiency, while also sporting an EPA certification, though it is not CARB backed. Full-time solo RVers agree that this comes in with excellent power at a great price, powering small appliances, tools, and home electronics like it’s nothing. The noise on this isn’t too bad, though it is exhaust-based, not mechanical. You get a killer two-year warranty if not for commercial use, with optimum fuel efficiency. Based on the weight, this is best handled by a two-person team. If you’re bringing a vehicle on site besides the RV, loading this up into the bed of a truck of the trunk of an SUV works well and doesn’t emit too much heat, so you can operate your generator without having to remove it. RV generators are similar to all other types of backup generators, except these ones that we’ve selected are prime for the open road, campsites, and everything you need to get your appliances and electronics moving. We’re going to cover various types of portable generators available, including some types that aren’t shown in our list, as well as the key features you should be looking for, and what they all mean. We’ve premiered gasoline models on this list for versatility, renewability, and more, but there are more different types of RV generators available. Gasoline: The easiest to plug-and-play, the quickest way to get started – gasoline generators are the most common, and provide 10+ hours of energy per gallon of gasoline for the higher-operating models. With constant availability, gasoline generators are the best way to jump from work to a three-day RV trip. Propane: You’ve probably used a propane grill in your time. Propane burns at a higher heat and utilizes less volume, making it optimal for grills, but not always the best for a generator. You won’t find a lot of propane generators, but the ones that you do find will generally have similar benefits to gasoline-powered generators. Diesel: Diesel fuel is different than gasoline and propane, containing a higher concentration of carbon atoms than gasoline. Diesel is directly distilled from oil, and generally costs more than gasoline to run on a generator, which is why you won’t see too many. Solar Generators: While these types are still up-and-coming, solar generators help give you some energy independence. They take a good amount of time to charge, and are primarily used in emergency situations. For constant, full-time RVing, solar generators are not ideal when you’re continuously running equipment, such as a refrigerator or small appliances/household electronics. Dual Fuel: These are simply a mix that can run off of either gasoline or propane. They don’t have two separate tanks, they’re just optimized to use either fuel source to increase versatility. Power consumption rates vary depending on which fuel you’re using, or if you’re using a mix. As the title suggests, it’s a generator that’s integrated into your RV as opposed to resting on the ground on the outside of your RV. There’s a reason that the market for onboard generators isn’t vast – they’re more trouble than they’re worth. Noise, exhaust, and heat are all major issues that occur when you run onboard generators. There’s an irony that the cabin heats up, so you run the AC, but in the end, the AC is aiding in throwing the heat from the generator. All in all, it’s a bit of a mess, but they do have their perks. If it’s raining or snowing out, or you’re on a campsite that doesn’t allow noisy, exterior generators, an onboard generator is best. For the most part, campsites don’t tend to have a problem with generator operation, so long as it’s before their set hours. 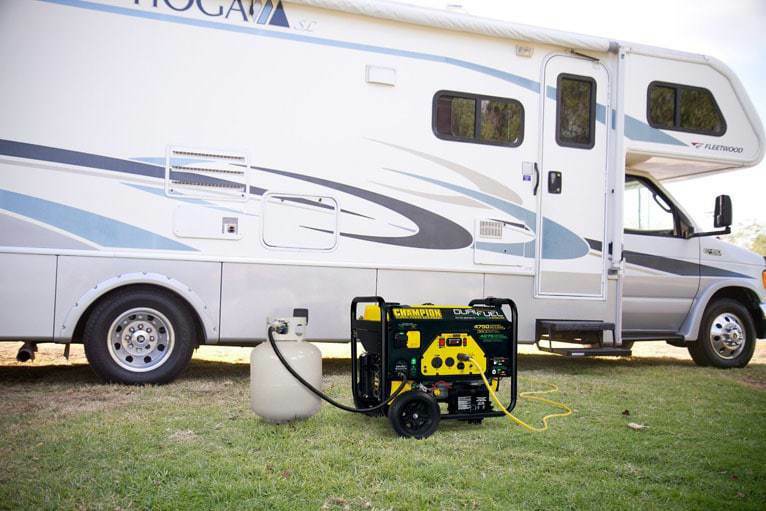 Going with a portable generator is preferred by many RV owners and experts of 40+ years. When you put a solar energy system into place, there are numerous factors that tie-in to your endgame. Panels are simply the beginning; they extract energy from sunlight, which is then fed through cables to a charge controller, and from there to a battery bank. With a solar energy generator, all of those things are tied into one item. There’s less setup, hassle, and you don’t need to purchase several components to get the energy that you need. In short, they’re two entirely different items that both utilize sunlight as an energy source. Onboard units have their problems. In comparison, portable generators and their setbacks are child’s play to deal with – there’s no overheating, exhaust ventilation problems, etc. like you get with onboard units. With a portable generator, potential malfunctions occur far away from your RV, you run no risk of exhaust causing respiratory issues (as long as you’re not having the thing). Apart from those, there’s something simple about filling the gas tank, turning it on, and having everything be taken care of. Uncomfortable heat and noise are all 10-20 feet away from your RV. The only problems you encounter with portable units are usually inclement weather. Bus-sized RV with a large family? You’re going to be using up a lot of electricity, especially with little ones afoot. Some models, such as the WEN portable generator on our list, can utilize adapters to connect to other same-sized generators and double your power output. When using multiple motors, there are a few things to consider, mostly in the cost category. If you purchase a larger generator, you may actually be spending more money in average fuel consumption. Depending on the hours per gallon, you might have better energy efficiency with a few smaller generators being used together. It also gives you the opportunity to only use one if you’re going on a solo or two-person trip. If you run into system malfunctions with a single unit, you’re out of luck, but going with a few smaller ones means that either way, you’ll have one that’s operational. Your portable generator has a system to get electricity to your preferred devices. Much like your car engine, the first step is gasoline turning in your combustion chamber, which kickstarts the alternator. The alternator is essentially trading combustion energy for electricity, which then flows through to your outlets. From there, it’s just plug-and-play. Your generator keeps a constant stream of electricity going to your outlets, so make sure you get the most out of them and don’t underuse them. If that last bit was too quick, let’s break down the different components of your portable generator into individual parts. Understanding these will help you when we get to a later entry in our buying guide: maintenance. Think about your car engine. You have a body and hood to keep it safe, right? Your frame is doing the exact same thing for the valuable working parts of your entire unit. Most frames are made of hollow steel tubing or corrugated aluminum and provide enough protection to store boxes and other items atop your generator in storage and transit. There are only so many types of combustion chambers/engines used in generators that are available to the public. Your system is the generator, and one component of how it works is the combustion chamber/engine. These build up raw power from ignition and gasoline and kickstart the alternator. The alternator is something that can be replaced if ever need be, and is the key that transfers your fuel source into electricity. The easiest way to know if there’s an issue here is if your engine is running, but you’re having little to no electrical output. Given their position, it’s easy to spot maintenance issues with your fuel tank. These are rarely over 7 gallons, and in comparison to the rest of your unit, they’re sized accordingly. These are a bit of an intricate pain to replace considering what you have to connect them to. The sound is measured in decibels when you’re talking about consumer products. They don’t really measure how aggravating or distracting a sound is, just how loud it is. For example, some units have louder mechanical noises, which are easy to ignore, and some have louder exhaust noises, which can be distracting. Decibels are essentially a loudness scale. Eco-mode lowers the RPM of your engine, reducing sound (slightly) while optimizing performance with lower gas. When you’re low on fuel of any type, it can impede upon the way that your equipment operates. Eco-mode slightly lowers the performance safely. When you look at the sales page for any model, you may see information pointing to eco-mode kicking in when the fuel indicator reaches a certain load capacity, such as 25% or 50% (common). These are a few rules of thumb when using a portable RV generator. Following these are a matter of safety, efficiency, and keeping your system running smoothly without damaging it. Monitor Heat: Just because your unit can run for up to 12 hours doesn’t mean you should push the envelope on a daily basis. If it’s a hot 90F+ day out, and your generator is sitting directly in the sunlight, it may get a little too hot to handle after continuous use. It’s an engine – it’s meant to heat up, but maintaining the temperature helps maintain your system’s integrity. 20ft Rule: You can put your generator close to your home, but there are a few safety concerns with it. For one, the decibel rating on your unit is usually inspected/measured at an 18-21ft distance away from an RV or campsite. It will appear louder the closer it is to your RV. Furthermore, keeping exhaust as far away from your RV as possible is always preferred. It prevents it getting sucked in by your RV roof vent fan, leaking in through the windows, and keeps the air quality nice and clean. Wind speed and direction play into this. Keep it Level: Your fuel tank should be as level as possible. Don’t offset it on one side when you place it on the ground – having half of it over a tree root or something of that nature is going to mess with fuel efficiency. You’ll have fuel tilting to one end of the tank, and that can mess with your eco-mode. Your personal items may differ, but you can find out use the specs on your items with a formula to figure out how much energy they’re using. The fact of the matter is, your generator is going to operate at the best possible capacity, so you want to utilize your runtime. Find other rechargeable devices and alternatives to consistent electronics. Charge a Kindle to use when you’re not using the TV (you can download movies and such, and view them offline). Use this bulk of electricity to charge other items. If you’re running large appliances such as a chest freezer, refrigerator, or anything else that’s using 240V, those are going to use up your available electricity the fastest. You’re bringing a heat-bearing device into the wilderness. Placing it down somewhere safe is key. We talked about it being level, but you should also factor in the surroundings. Don’t put it near dry brush or sticks. If available, use a tool to clear an area in the dirt, and avoid grass. You’re producing emissions in the environment, throwing heat, and there’s a lot of responsibility that comes with that. Look out for a spot that has little to no branches overhead. A clear path for exhaust to travel will avoid damaging plantlife and cut down on how hot one area of your campsite can get. Keep it level, clear of grass and dry brush, and out in the open away from tree trunks. These are the main components that you should really take a hard look at during your purchase. We’ve expanded on the importance of each individual factor, and what role they should play in your decision. We’ve only covered portable models here, and it’s for a good reason – portability is everything. It allows you to have complete control over exhaust, heat distribution, and where you need your power. Portable gasoline models are favored among the RV community for multiple reasons. We don’t all have a big budget when heading out to RV. The runtime directly plays into your costs with fuel purchases, but also factors in how much time you’ll be able to use your generator for. If you’re planning to binge-watch a television show or movie marathon, or you’re looking to keep your fridge constantly running, the longer the runtime, the better. Outlets, RV direct hookups to power your electric system, adapters for multiple generators – they’re all important parts of compatibility, and versatility. Another play into your cost. With portable generators, it’s all about getting the most efficiency. You’re making an investment, one that can last for well over a decade even with continuous use. Over time, fuel efficiency is going to save you a fortunate (potentially the initial buying cost of your generator). Depending on your state of origin (notice for California residents at the end of this guide), your state may require you to have EPA and CARB certification. Not every model on our list comes with both, so pay close attention before committing to a purchase. You always want to be backed by a warranty, at least a little bit. Most problems are going to occur within the first six months based on full-time RVer reviews, and the models on our list start out at a one-year warranty, all the way up to three years. You’ve committed to the purchase. Now, it’s time to equip yourself with a touch of knowledge on maintenance to upkeep your system through any incident. Each model is different, but your air filter is located close to your air intake fan/valve. From here, you’ll usually need a Phillips head screwdriver to remove 2-4 screws from the area, remove the cap, and you’ll be able to find the air filter. Most models made foam air filters that you can clean in 1-2 minutes. Just be certain to have this completely air dry before returning and reapplying the cover. Water and electricity don’t mix. This is especially useful for off-the-grid users. We all know the importance of replacing oil once it’s been burned through, but the damages left behind aren’t that much different from your car. The longer you run your generator, the closer you’ll come to needing to replace the filter. The rule of thumb behind this is to change your oil filters after every 100 hours of use. Since these are air-cooled, not water-cooled like a car engine, build-up and sludge occur at a rapid pace. These are simple to replace, and are located within the pages of your starter’s manual. They’re most commonly located near the fuel tank. When it comes to your electrical system, you can’t be too careful. DC stands for direct current, while AC stands for alternating current. Your direct current is used to power larger items, such as appliances or power tools. You’ll be familiar with the various plug styles when you think back to your washer and dryer hookup. When it comes to your electrical system, there’s not a whole lot to it. The primary focus is generating the electricity, which all involves your fuel tank, combustion chamber, and your alternator. You’ll know when you have an issue with wiring when you’re running the engine, and that works fine, but you’re not getting any electrical output on the other side. You’ll have to purchase brand-specific wiring packages, which will come with detailed instructions on how to change them out for that specific model. Depending on certain EPA and CARB standards, these items may not ship to your location, based on zip code, due to California’s emission laws and governing policies. For more information, visit localized municipality websites, as well as California’s state government official website. With advanced electricity generator solutions at the helm, what are you your goals? How did your journey with purchase, setup, and operating your system go? Let us know in the comments below. You’ve been tied-down by metered utility lines for too long – take control, generate your own electricity today.